Geek Girls Rule #147 – Creators Edge Press: The Reviews, part I – Geek Girls Rule!!! Ok, I’m going to divide these reviews into two parts, because Creators Edge Press gave me several comics to review and I don’t think I could fit them all in one post. I’d like to start with the zombie comics, as I did get these at ZomBcon. 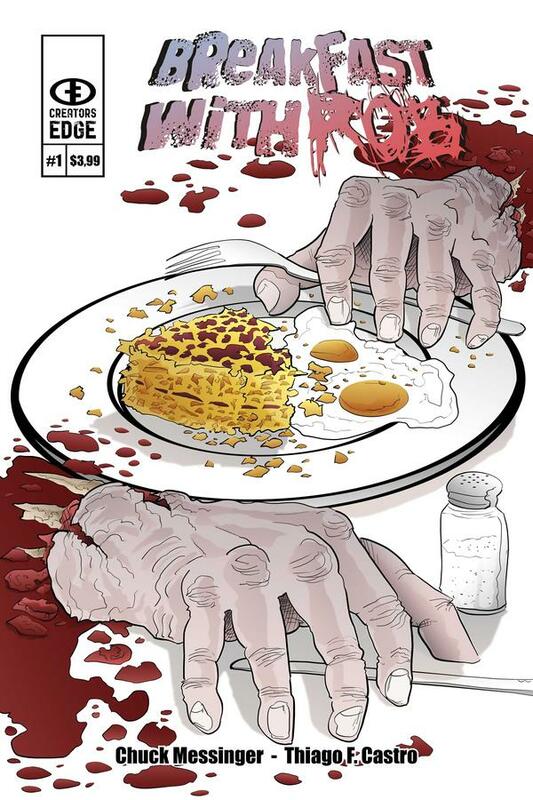 Breakfast with Rob written by Chuck Messinger, art by Thiago F. Castro. I like the premise of this comic, a lot. The zombie apocalypse has happened, and no one knows it yet. You never find out what caused it. It just happens. And the recently deceased go through the motions of living for awhile, like, say, meeting their old buddy for their traditional breakfast at a local diner, before you really know what’s going on. I like that you never know what caused it, it just is. Because, let’s face it, in spite of what every zombie movie in the world says, we don’t know exactly how things like the flu and HIV came into being. I doubt we’d be able to sort out a plague that consumes nearly everyone it contacts in such a short time. I also like that the protagonist isn’t a “hero.” He’s a guy, faced with a horrific situation, and he reacts like a real person. He doesn’t immediately come up with a brilliant plan to save himself and everyone else. The writing is solid, with believable dialog, though most of the dialog is the protagonist’s inner monologue. The art is not real exciting to me, but I do love the decision to do the comic in black and white, with red being the only color in the whole comic, whether it’s blood or ketchup. 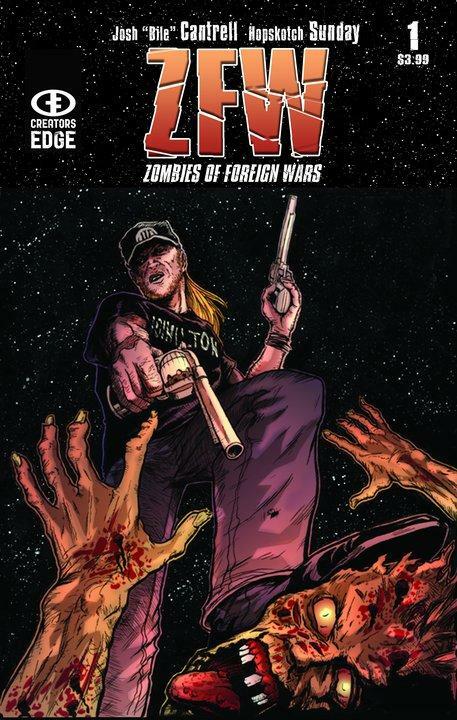 Next up is ZFW: Zombies of Foreign Wars, by Josh “Bile” Cantrell, art by Hopskotch Sunday. Ok, when Chuck and Ash explained the premise of this comic to me, I was hooked. The zombie plague hits, mistakenly created by some kids doing a satanic rite in a cemetery. One of the survivors of the initial batch of zombies makes his way to the local VFW (Veterans of Foreign Wars) Hall. Of course the guys there don’t believe him, until they see the zombies for themselves. They then arm themselves to fight the Zombie menace, and decide to make their way from VFW hall to VFW hall gaining troops and weapons and munition. If you are offended by salty language, I would not recommend this comic to you, as these guys talk like, well, rednecks. I found the dialog believable and realistic, because these guys talk like my uncles. I like the art as well. I can see where the artist still has some maturing to do, but the style is distinct and easy to follow. 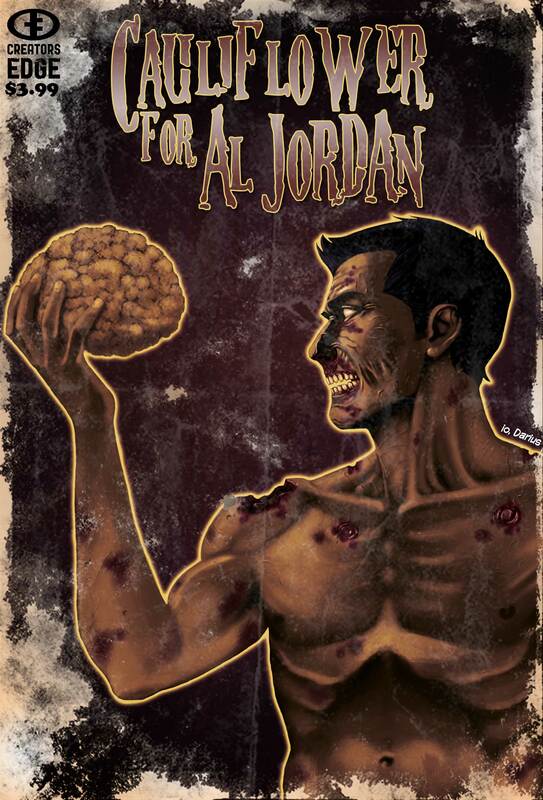 Ok, now my favorite of these three, Cauliflower for Al Jordan, written by Chuck Messinger, art by Dario Reyes. A riff on Flowers for Algernon, it follows the adventures of a zombie who mistakenly eats a head of cauliflower, thinking it is a brain, and who starts to get smarter, and eventually recovers. The story is told, initially with only pictures of the action, but eventually Al recovers the power of speech and decides to keep a journal of what’s happening. I enjoyed the hell out of this comic. The evolution of Al’s voice is great. The art is really well done, and expressive. I really like all of the Creators Edge titles I’ve read so far, and I’m looking forward to seeing what else they come up with. I’ve linked the titles to their store page, so you can find them. They also have a list of retailers where you can find their titles. I liked ZFW a lot!! Actually, I was in as soon as they described it. The premise is awesome! Cool that you got a chance to review these, I really enjoyed all three of them, especially ZFW, Josh has got the veterans voice down pat and being one myself I really appreciated it. Seriously, all three of them are awesome, if you see them, pick them up, you won’t be sorry. Come down to Comic Evolution in Puyallup and I will gladly hook you up! Cauliflower for Al Jordan was simply superb. Me am impressed.